IDBI Bank today announced it has 28% bad loans. For every 100 rupees they’ve lent, nearly Rs.28 has gone bad. Do note that even the best banks don’t earn more than a few Rupees per year as the Net Interest Margin and here we are seeing banks lose money that was earned over years in single quarters. Banking is a simple business – you borrow from investors at a low rate of interest and lend to borrowers at a higher rate with the difference being the margin you make. This is also called the Net Interest Margin. The total difference though doesn’t become the profit for the simple reason that there are costs to run the business and secondly, not all borrowers tend to repay their borrowings requiring banks to write it off their balance sheets. But what is a bank that cannot lend to borrowers? Is it still be viable to be called a bank? A quick note: Banks have to maintain “capital” as a percentage of the loans they own, which is weighted based on the risk of that loan. So a regular loan has a 100% weight. A loan to a risky corporate may have a 150% weight. A bond of the government may have a 0% weight (near zero risk). The higher your risk weighted assets, the higher you need to have as capital. Every loan default reduces your capital. So as bad loans grow, they deplete capital. The capital ratio (of risk weighted assets) needs to be above 6% – and at this point, the RBI says don’t lend to other people since you have no capital buffer available. Just park money with the government. This is what is happening in case of Dena Bank, a Bank that was formed in 1938 has now been advised by RBI to stop the business of lending to borrowers and instead just invest the monies in government bonds or park at RBI. That’s because they have way too many bad loans. Allahabad Bank was advised a couple of days back to restrict expansion of risk weighted assets and reduce exposure to un-rated and high-risk advances –a step closer to what Dena Bank is facing. Without the business of lending, the Net Margins of Banks will plummet. Without net margins, you can’t have profits. Without profits, you can’t increase capital (capital automatically goes up as profits are retained). This makes it tougher to get back to any sense of normalcy. The only way out is to either raise capital by issuing more shares to someone, or cut down costs by way of closing unviable branches and firing employees – but that is not even thinkable let alone doable. 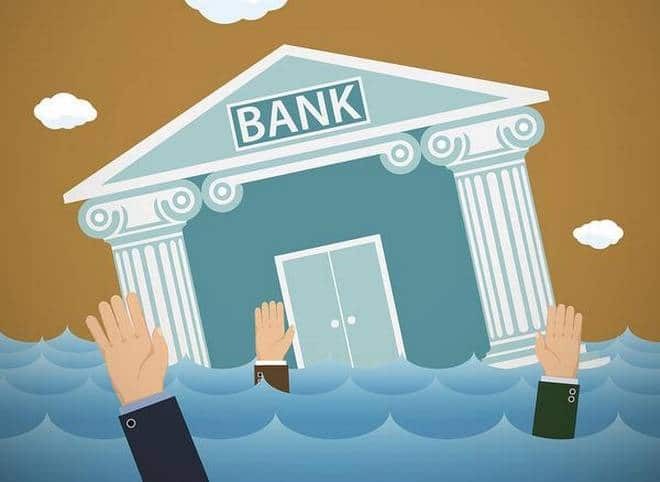 The slowdown in the Industry and the cyclical nature of certain sectors has placed a huge burden on banks who had lent money to those currently caught in the storm of rough weather. Years of Evergreening has meant that the assets that were backing the loans have little of real value compared to the ballooned up loans that currently sit on the bank balance sheets. Last year, the Government of India proposed to put in 2 Lakh 11 thousand Crores into the affected banks. New capital should help shore up capital ratios, for one. While fresh capital is always helpful, the problems are far from gone. In fact, things have only turned worse with supposedly better banks like Punjab National Bank coming out with the Nirav Modi scam. The Nirav Modi scam has resulted in a loss that is more than twice the amount of money that the government had committed to invest to support their growth, for a single bank: PNB. Bank Crisis and government interventions aren’t singular to India. As we saw in the financial crisis in 2008, the US government came to the rescue of Banks it deemed too big to fail. Same was the case with certain banks of Europe. Chinese bank issues aren’t as well known but there too we have seen serious amount of money being injected to support the growth of bank and allow them to write off bad debts. While the speeding up of resolutions through NCLT may help a few banks in a few cases, they only crystallize losses: Effectively banks have to still raise capital. Dena Bank hasn’t booked a Profit before Tax for more than 12 quarters now. With the current mission being focussed only on recovery, it’s tough to see how it can turn itself around unless some of the bad debts that it has written off turn out to be assets that are bought by other investors at much higher prices. If Dena Bank could have sold assets at higher values, it would have already done so. While these are smaller banks, like the shark where only the fin is visible, even here the big issues are currently under water and seeming to rise up any moment. Canara Bank, Punjab National Bank and Union Bank – three banks which once upon a time were said to be big enough to shoulder the burden of talking over smaller unviable banks now find themselves on the radar of the RBI. In 2015, RBI signed an information sharing mechanism with US banking regulators and one outcome we can see in recent times is the PCA Framework for banks based on Federal Deposit Insurance Corporation. RBI by way of the PCA framework is trying to establish systematic groundwork so that when a bank activates certain triggers, certain actions will be taken to ensure that the bank doesn’t get into deeper trouble. This could be seen as similar to a checklist – rather than panic when a bank suddenly books a large loss, RBI is trying to set up a protocol as to how to deal with banks as and when they trigger certain financial conditions. So, what are these conditions and what happens when Banks trigger it? All Banks will be segregated based on their financial condition into one of the following three quadrants. An example: A bank has to maintain Capital (Common Equity Tier 1 Capital or CET1 Capital) of more than 6.75%. If it falls below but it’s still above 5.125% – that’s Risk Level 1. If it falls below that but is above 3.625% that’s Risk Level 2. Further below and it’s Risk Level three. Leverage ratios hit 25x their capital. 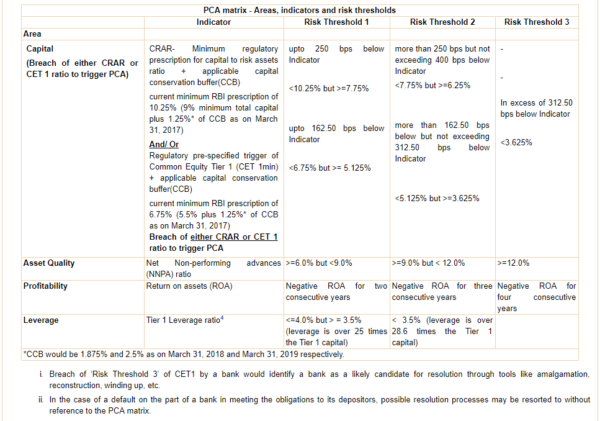 As the above table shows, Banks and Investors can have a clear idea of where a bank stands based on its financial ratios. And if the Bank is in Risk Threshold 3, the bank has very little choice though we are yet to see any evidence of the government willing to step up and merge the weaker bank into a stronger bank while at the same time writing off the equity. PCA is, in our opinion, the way to make a bank “zombie”. Meaning, it can’t lend any more so it can’t be profitable. It can only try and recover loans. At the same time, it may bleed deposits as customers get spooked and move their money to other banks. Then, the bank has to borrow from other sources, like the RBI itself, in order to pay off depositors, until it recovers money from the loans it has already given. Raise capital. No one will want to buy such a bank, but there will always be a buyer at a low enough price. Dena Bank may be at Rs. 16 today, but surely there are takers for it at Rs. 2 instead. However raising that much, at that price, will mean that the government will no longer be a majority holder, and that won’t be easily acceptable. Merge with another bank: The bad bank’s equity will be wiped out, and the acquiring bank can then raise capital with a stronger combined balance sheet. This may be more acceptable, though unions will kick up a fuss. PCA can only result in one of the two, but the time it takes to get there can be forever. That makes them “zombie”. We’ve had cases of zombie banks before – in Japan and Korea. But with 70% of India’s banking system in the hands of PSU banks, we can’t have them all go down the zombie way. Weaker banks have been asked to adopt a differentiated business strategy, exit non-core businesses and focus on core competencies. But these are not long term solutions for if they could have done that, most banks wouldn’t be at the current place in the first place. Banks are seeing a problem that is more structural in nature and one that requires a thorough overhaul. The government’s way has been of investing more money in the hope that the problem goes away and if there is anything that is certain, its been that the problems and issues that Public Sector Banks are facing are simply not going away. There are a few things that are wrong. Public sector banks can be given capital, but what’s the point if they continue bad lending? PSU banks don’t even try corporate recovery. RBI had to force them to take companies to the NCLT for bankruptcy. But even then, banks have good assets pledged to them, but they refuse to sell and take the money home! Case in point: in most cases where shares are pledged to PSU banks, they don’t invoke the pledges and sell the shares, when there is value. Outsourcing due diligence of Risk to the Lead Financier: Large loans and those with a long gestation period are rarely provided by a single bank. Instead, one bank takes the lead with others chipping in a small part. The risk here is that the smaller banks don’t seem to bother with performing the due-diligence required before disbursement of the loan. While a SBI can withstand a loss due to default, a UCO Bank or a Central Bank doesn’t really have the ability to absorb the losses that may come with taking such a risk. With Public Sector Banks being government owned, there is a lot of pressure from varied interests on whom to lend. In cases where the government is interested to see the projects go through, viability is often not a criteria that is followed. The very fact that Private Banks, NBFC’s and other financial institutions which aren’t controlled by the government hasn’t seen problems of similar scale portends to the fact that, on a whole the issue is not universal compared to say the US 2008 Financial Crisis which affected literally every financial Institution in US. Private players are waiting for decades for Banking Licenses that are’t forthcoming. Only by shedding the historical baggage can the country move forward and this requires a drastic change in thought about whether it makes sense for the Government to be operating so many banks in the first place.